Of course, any time there is a new baby arriving in the family, I’m going to be making something. Traditionally, I’ve made handwoven baby blankets. Unfortunately, I don’t have a space to set up my loom right now with all the remodeling going on in our house — it’s still folded up under a blanket in the unfinished dining room. So this time, I opted for knitting. These patterns by Anne Hanson feature a matching lace motif. The jacket pattern offers a wide range of sizes and also includes a matching hat, which I did not make. 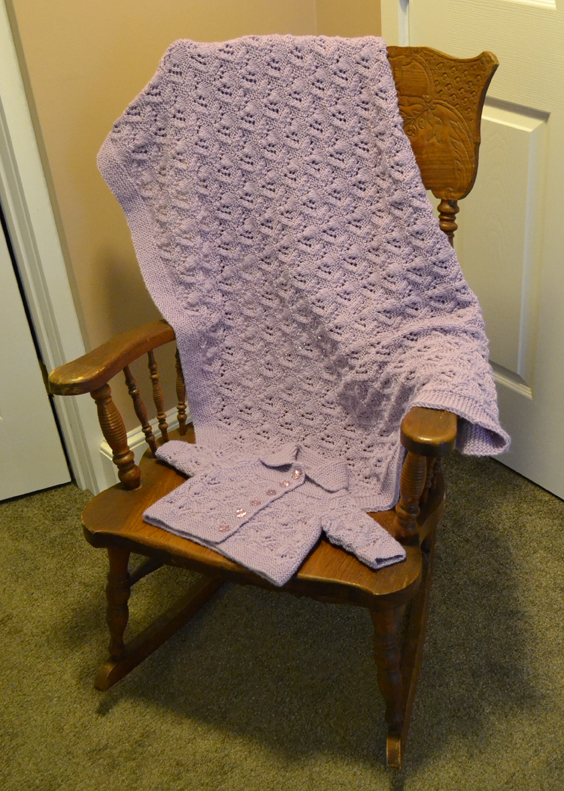 The blanket was a very easy knit — obviously, since there’s no construction, just a big square. And the jacket was surprisingly easy, too; it’s knit in one piece from the bottom up to the armpits, then the sleeves are knitted separately and joined to knit the yoke in the round. Finishing things up seems to happen in threes. 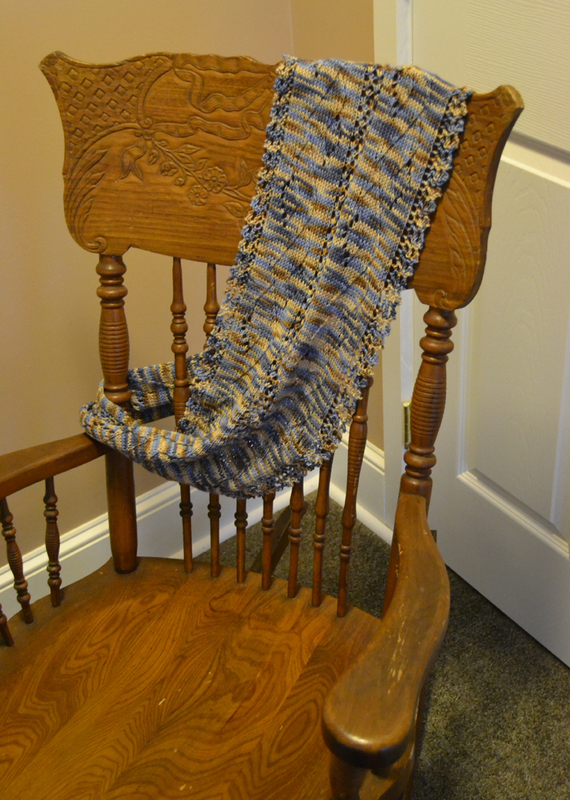 Here’s the third item — a scarf I started last fall which became a Mother’s Day gift for my Mom. It’s a circular scarf that can be worn as-is and longer, or doubled up as a cowl. Heck, you can even double it up and have half around your neck and the other half over your head if it’s cold. Mom doesn’t like things up close to her neck so much, so she’ll probably be wearing it long most of the time. 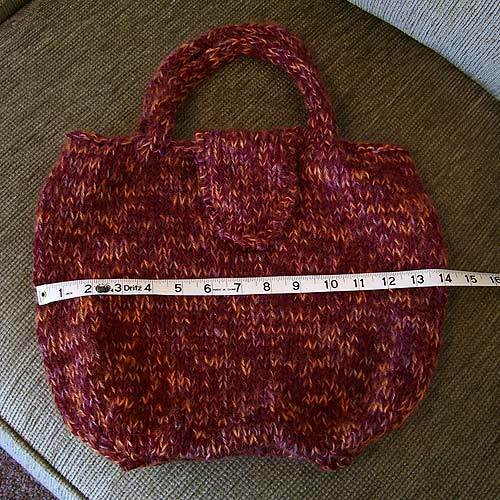 This is my own design which was “homework” for work — it was included in a sheet of free patterns that Patternworks sent out with the purchase of certain limited-edition yarns (which are sold out now, unfortunately). Finished up a second birthday present for Mom, another pair of footies. This is only the second pair of footies I’ve made out of Cascade Fixation (cotton/elastic), but both times I enjoyed it so much that I now have 3 or 4 more balls of it in the yarn stash. Plus enough Fixation for another pair of footies that’s left over from the very first pair I made. Pattern Modifications: For this pair, I knit them toe-up, 2 at a time on magic loop, with a slip-stitch heel a la Wendy Johnson. In order to get the slip-stitch heel to work properly, I added 2 more stitches than LynnH’s original pattern calls for (46 instead of 44). One of the reasons I love this pattern is because it’s such a fast knit. As far as my modifications go, I’m still not completely happy with my math for the gusset and heel — the footies are a little tight going on. I think I need to increase a bit more for the gusset so that the heel flap ends up being longer. Of course, it didn’t help that I was knitting ridiculously tight… probably releasing stress into my knitting or something! I really need to learn to relax a bit when working with the Fixation. Well, now that Mom’s birthday has passed and the present is no longer a surprise, here are the bloggy details! 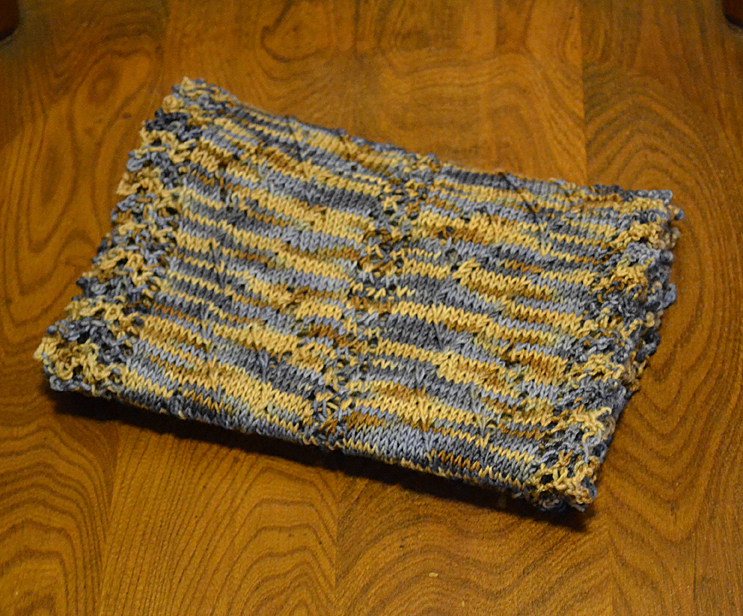 This was a really fast knit — even though it was a whole week from cast-on to bind-off, I didn’t work on it every day. In fact, I think there were at least 4 days or so where I didn’t touch it at all, and there were some days where I only did a couple of rows. 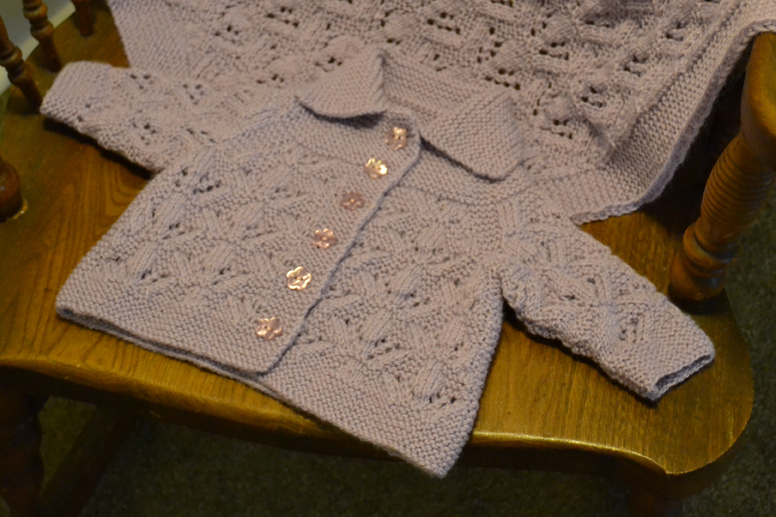 The bulk of the knitting was done on the first and last days. It’s also an extremely easy project to make! The photo on the right shows the bag before felting. 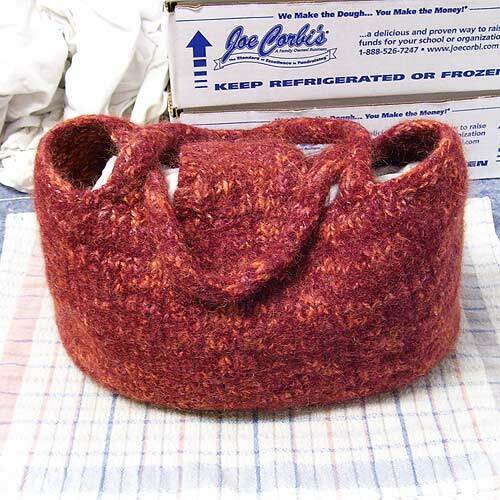 The photo below shows the bag after felting, while it was drying. (Click on the photos to see a larger version.) It shrank a little more in height than width. 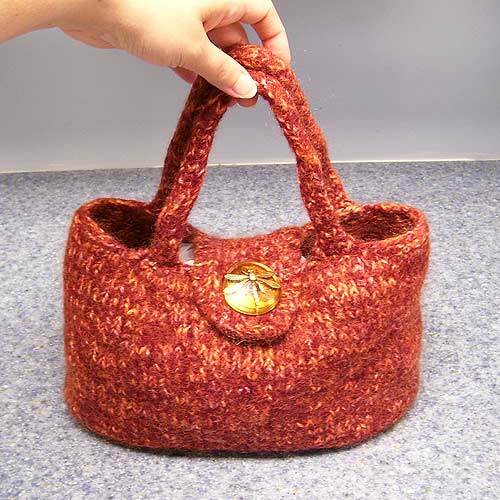 After felting, the purse measured about 12″ across (when flattened), and about 9″ from the center bottom to the opening on top. So, it ended up roughly 75% of its pre-felted size. I probably could have felted it a little more, but any smaller and it wouldn’t really work for Mom. As it is, I don’t think it will be a daily-use purse for her, since she tends to have a heavy purse full of all kinds of stuff. But I think she’ll still appreciate it and use it at least occasionally.